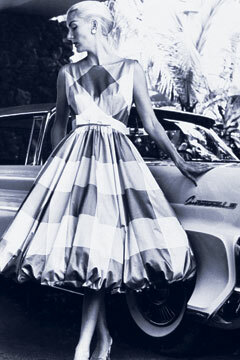 Tori Richard, celebrating its 50th anniversary, has been at the center of many a fashion moment since 1956. At left is a Tori Richard outfit that appeared in Vogue magazine in 1970. Dressed in a 2006 bubble skirt which I imagined owed some of its buoyancy to Christian Lacroix's 1980s pouf dress -- the sherbet-colored shame of thousands of Gen X prom-goers -- I was paging through "Tori Richard: The First Fifty Years" when, surprise! The company had already been there, done that, way back in 1959. "Tori Richard: The First Fifty Years"
Meet author Jocelyn Fujii at a book signing noon to 3 p.m. Saturday. "Tori Richard: The First Fifty Years": Book signing with author Jocelyn Fujii, noon to 3 p.m. Saturday. "Tori Richard: A Retrospective": Storefront displays on view through Oct. 31 feature a rotating collection of vintage apparel. "Champagne Collection": Jewelry trunk show and demonstration featuring Hilo-based jewelry designer Paula Nurse, with earrings, bracelets and necklaces for the "Tori woman," noon to 3 p.m. Oct. 14. HIFF 2006 launch party: Unveiling of the first Hawaii International film Festival commemorative shirt, created through a partnership with Tori Richard, 4:30 to 6 p.m. Oct. 21. Pre-order the shirt via www.hiff.org. "Tori Richard Golden Anniversary Christmas": Ornament designer Christopher Radko will sign his limited-edition, glass ornament, 1 to 3 p.m. Nov. 2. The $42 ornament is a sparkling red aloha shirt inspired by Tori Richard's signature "Date Palm" shirt design. Tori Richard's harem dress, reflecting an architectural approach to fashion by the top designers of its day, is just one legacy of the locally built company that has survived -- though not without a bruise or two -- the fickle moods and ever-quickening pace of fashion to mark its 50th anniversary, in style. The occasion will be celebrated during several free events this month and next, starting with a noon-to-3 p.m. Saturday book signing by Jocelyn Fujii, author of "Tori Richard: The First Fifty Years." Raised on Kauai, Fujii said, "Tori Richard is my earliest fashion imprint. I enjoyed their clothing from my parents' time. My mother would always wear Tori Richard as her Sunday best. Whenever we went out to dinner at Coco Palms, she would wear it." Writing the book took a year and a half, but the company's well-organized archive made the task easier. "Delving into the Tori Richard archive was so amazing," Fujii said. "It was like reliving Hawaii's past, almost since statehood. Through the decades you can see all the trends." At a high point, 90 percent of the company's market lay outside of Hawaii. Tori Richard designs found their way into I. Magnin, Lord & Taylor, Neiman Marcus, Sak's Fifth Avenue, Bergdorf Goodman and other high-end retailers and, ultimately, jet-setter wardrobes of the 1960s and '70s. In 1970, Vogue magazine devoted an eight-page spread to Tori Richard, featuring mod muse Penelope Tree and other top international models of the time. With an artist's eye, founder Mortimer Feldman quickly built a reputation for prints as bold as anything created by Emilio Pucci, but in far more saturated colors, often evoking a Polynesian or Asian aesthetic. His eye for design quickly catapulted the resort-wear company beyond the muumuu and aloha shirt set, into the jet-set league, in step with the likes of Pucci, Ossie Clark and Celia Birtwell, and Biba. It was an exciting place to be, but what kind of story would this be without a touch of drama? A little more than a decade later, the company lost its way. MORTIMER FELDMAN had already been a successful garment manufacturer when he retired to Honolulu, at 32. But there are only so many mai tais one can drink before getting restless, and his solution was to go back to work. With his soon-to-be wife, designer Janice Moody, and pattern-maker Mitsue Aka, he launched Tori Richard in 1956, named for Moody's daughter, Victoria, and Feldman's son, Richard. The company was built on women's resort sportswear, but 1969 proved to be a pivotal year, when Liberty House requested men's shirts made of Tori Richard's renowned women's prints. The shirts were an instant success, and by the 1980s, men's sportswear sales had overtaken the women's line so that today, a younger generation still associates Tori Richard with men's shirts. In 1983, Feldman started his second retirement, keeping ownership of the company and leaving its management to others, eventually moving his family to New Zealand. He returned in 1994 to find the company in shambles. With his youngest son, Joshua -- today president and CEO of Tori Richard Ltd. -- he started the comeback process. A Bongo Panel shirt and canvas cargo short from the company's spring 2007 men's collection. JOSH FELDMAN spent most of his young life studiously avoiding association with Tori Richard. "I don't have one of those romantic tales about running around under the cutting table," he said. "I worked at a bike shop and in restaurants because I didn't want to work in the factory. I was embarrassed by some of the stuff we made, and I had a blood oath that I would never get involved with the company. "Children of company founders often don't want the nepotism label, No. 1, and they often want to go out and prove themselves, but once I got over that, I found it was a tremendous opportunity." Feldman had been planning to go to law school when he returned to Hawaii with his father in 1994 to a nightmare scenario of declining sales, obsolete product lines, low morale and soaring costs on top of a statewide economic recession. "That's what happens to small businesses when the owners aren't involved. There were morale issues, and that was the crux of the problem. Everything, whether poor product design or customer service, all flows from that sentiment that management doesn't care." The younger Feldman, whose siblings are scattered from California to Thailand, felt obligated to put off his school plans to help his father. "When we got back, he was 73. I didn't want him to be alone. "I think he wished we could be working together under better circumstances, but for me it was interesting to see the business in both situations. I know what the dark side is, and I never want to go back there." Josh went to work quickly, learning every job, starting with sewing up a shirt himself. "After six months we could see the light at the end of the tunnel. We knew it wasn't a wreck." Mortimer Feldman died in 2004 at the age of 83, after witnessing his son's success in redeveloping product lines and rebuilding mainland sales that had dropped to less than 10 percent of their market, creating Tori Richard's retail division and the opening of four high-brand concept stores. And, it turns out, Josh had absorbed a few things from his parents, such as an aesthetic shaped by shopping trips with his mother from the age of 3. He now selects most of the prints that go into Tori Richard designs, believing, like his father, that "ultimately prints are what determine the success of a garment. I always say we're in the art business." The company maintains a garment archive that has grown to include 2,000 garments, said Feldman, who says he's gotten into many bidding wars on eBay for pieces of the company legacy, and has recently digitized its print archive, numbering 18,000 prints. "We reference it all the time," Feldman said. "That way, we can bring back prints, recolor, change them." A full-skirted harem dress from 1959. FUJII HAS NO doubt that morale has rebounded and that Feldman has earned the respect of employees, some who had worked for the company for more than 30 years. "To me, that says a lot about a company. There's so much loyalty. There's an old-style way of really appreciating employees and treating them well. "When Josh came back they were very impressed that he wanted to learn every aspect of the company in a hands-on way," she said. "He had the smarts to do the business part, and he had the energy. It can be hard to come into a position, and he did not take anything for granted." While the anniversary book's reference to "The First Fifty Years" implies a second 50 years, Feldman's plans aren't all about Tori Richard. In 1997 he created a Licensed Product Division with Tori Richard as licensee for the Harley-Davidson Motor Co. The company also recently required another local fashion icon, Kahala. The men's aloha shirt brand is marking its 70th anniversary this year, but after switching ownership three times -- Tori Richard is its fourth owner -- much of the company's history lies in bits and pieces. "We're lucky that all the Tori Richard material has been preserved in archives, but there's nothing like that for Kahala," Feldman said. "Hopefully, we'll be able to tell that story in the next few years." A Hot House wrap dress from the Resort 2007 collection. Bold prints are the mark of Tori Richard.